Candidates can check the complete information of IARI Ph.D. Entrance Exam 2019 like application process, eligibility criteria, reservation policy, selection process etc through this page below. 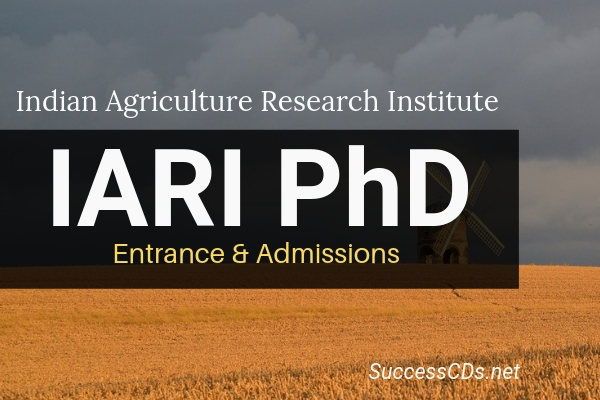 PhD Programs in the various disciplines of Agriculture Sciences at IARI, New Delhi and discipline of Agricultural Engineering at CIAE, Bhopal and disciplines of Horticulture and Post-Harvest Technology at IIHR, Bengaluru. Note: Candidates who appear at the Master’s Degree final year Examination in 2019 are also eligible to apply and appear in written entrance exam provisionally for PhD program. However, they will have to submit documentary evidence of their eligibility on or before 30th June 2019 failing which they shall not be considered for Interview. The minimum age for admission shall be 21 years as on 31st July 2019. No relaxation is admissible regarding the minimum age limit. The candidates sponsored under this scheme should be regular employees of the university and should be likely to continue in service after obtaining the training; the candidates should be sponsored on deputation terms entitling them to full salary and allowances; no fellowship shall be awarded to them by the IARI. 15% of the total number of seats is reserved for SC - 07% & 1½ (a-half percent) for ST candidates subject to their being otherwise suitable. An identical procedure as above will be followed in the case of Scheduled Tribes reservations also. After these two exercises, if any seat(s) still remain(s) unfilled in the SC/ST categories respectively, such unfilled SC/ST seat(s) shall be transferred to Scheduled Tribes/Scheduled Castes category and filled up by the available eligible candidate(s) in the concerned category. Under no circumstances, the SC/ST seats shall be transferable from M.Sc. to PhD Program and vice-versa; the SC/ST candidates who are selected for admission on the basis of merit may not be counted against the reserved quota and there is no maximum limit on the admission of the candidates belonging to the two categories. 18% of the total number of seats is reserved for other backward classes candidates subject to their being otherwise suitable as per the norms of ICAR/Govt. of India. Academic Attainments (Record) - Weightage for academic attainments (High School to a terminal degree) would be 10%. The highest mark scored by the candidates within each discipline will be considered as the maximum mark (=100%) for calculating the % mark within that discipline. Information Bulletin can be viewed from the Institute website https://www.iari.res.in. Candidates are required to submit their application form Online only. For instructions please refer page 24 of this Information Bulletin. A candidate who has already been awarded PhD degree from IARI or any other university/Institute shall not be allowed for entrance exam for the same degree. However, advance copy may be submitted to the PG School along with required documents and details of fees transferred through NEFT. Candidates who are in employment are required to take the printout of their application form submitted online and send it through proper channel to the Registrar, Post Graduate School, IARI, New Delhi-110012 so as to reach before the last date.